Old photographs offer a lot of information about fabric also found in quilts at the time. 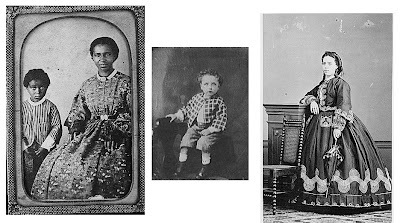 These three portraits from about 1860 are from the Library of Congress website. Remember you can click on blog photos and they will enlarge (most of the time) so you can see the details. One of my favorite websites is Flickr's "The Commons", a group of historic photos. Click here to see the Southworth and Hawes set of mid-19th-century pictures of Bostonians, posted by the George Eastman House, a photography museum in Rochester, New York.